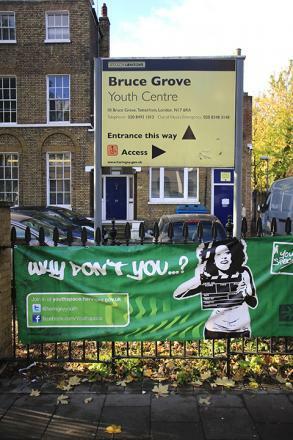 To keep up with the campaign to Save Haringey Youth Services read its latest informative Public Statement. We can’t resist quoting in full its summary of a number of conversations this last week between young people and the Council. Us: “Huh? There are people on my estate looking for work”. Next On Elections, Young People and the Future : The Greek Alternative? A Few Days Away? I was at tate meeting the Council Officers and Councillors are clueless. They’re now talking about putting a strategy together in February! This is fantastic. And quite funny. (Though the outcome might not be). Who would want to charge that amount of money for running a youth service of childrens’ service? Personally, I can’t imagine that they can be people who might “really care about the borough”. I would also guess that in most cases it will be a case of the revolving-door. The successful applicant will recently have left similar public sector employment. They may even be enjoying a redundancy package, leaving settlement package or pension pot from that previous employment. Quite possibly use of interims has some kind of financial logic for local authorities. (The authority hiring an interim manager of 9 months is clearly not in a hurry to fill a permanent position). But then what is lacking is political will from the centre to stop this gravy train. Of course they won’t because this gravy train suits members of all political classes very well. As I said in my original linked post I’d rather the Trade Unions had the bottle to tackle this issue rather than just pressing re-play on the traditional narrative about “Tory cuts”. And just to remind people that New Labour is no different from the other lot here is just one example. An IT consultancy located near to me charges NHS Trusts large amounts (I would assume) to provide software which analysis patient satisfaction surveys. This was all froth introduced by the last Labour government who realised that schemes to make people feel valued were far cheaper than changes which actually valued people. One of the directors of the company is someone who was a minister in that government. At too many local authorities now all the staff and senior management teams are on contract, being paid consultancy rates, which ensures they have no long term commitment to public/children’s services. It is people, both young, old and lower level staff who suffer. The scandal of this pay regime, which sees agency staff employed for several years, paid more than actual LA staff, even when they have no proper qualifications and experience in the field they are working in – i.e.they arrive, sometimes from another country, or another LA (a friends network) with no relevant experience and get the job because they will take less, if at lower levels of staff, so more can be paid for managers being paid lots more – and this is a problem. How such a system survives when there is great unemployment and austerity measures is a mystery to me and everyone else. One which it seems no highly paid consultant is going to solve. How many LA’s are cutting staff, but employing agency staff who are being paid more? That is the research that needs to be done in the boroughs that are hardest pressed. Only then will the truth be out!